This is 0.5mm multi colored leads from Uni(Mitsubishi Pencil). I blame for my carelessness. I dropped this from 1 meter height. I planned to compare regular color pencils with this color lead, but I lost motivation to do it. Once I often bought drafting mechanical pencils, I took bubble wraps to protect MPs. Which color is only 2? 7 colors, 20 leads should mean 3 leads for each color, except a color. Which color is less than others? You might think it’s obvious as it looks. Actually no, color difference is little to judge it. Blue + Lavender = 5 leads. So blue or lavender is “uncommon” color in this tube. ↓I can’t see middle one is whether blue or lavender. With saturation adjustment, I can see it. There’s only 2 lavender leads. 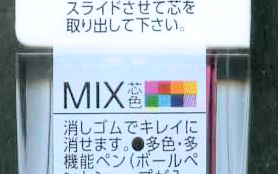 Mitsubishi Pencil insists colormix contains 8 colors..? The back of lead case indicates 8 colors. 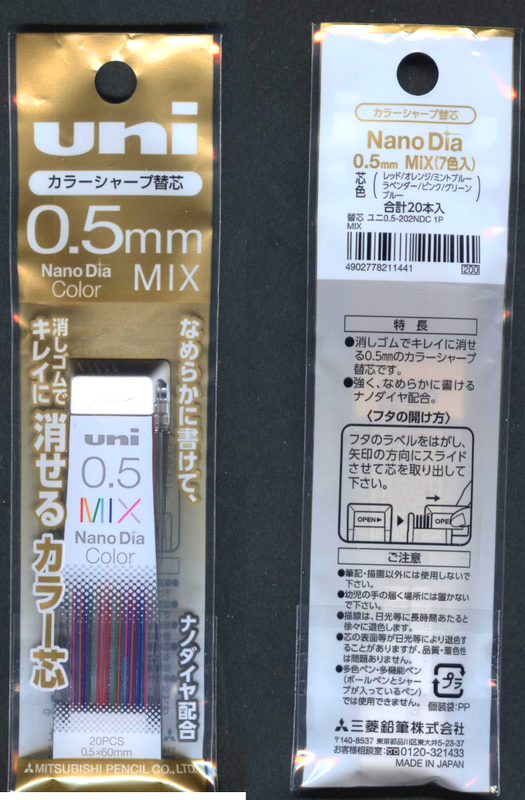 In fact, Nanodia Colormix doesn’t contain Yellow leads. Packaging film shows Nanodia Colormix contains 7 colors, but some stores sell this lead without film package. e.g: Sekaido”世界堂” usually sells lead tubes without packaging film.